house of spoon: sleeping beauty...and the beast? I love the fairytale quality, the fact that you know she is dreaming about walking through a quiet forest and discovering a secluded leafy glade bathed with sunshine directly in the centre. 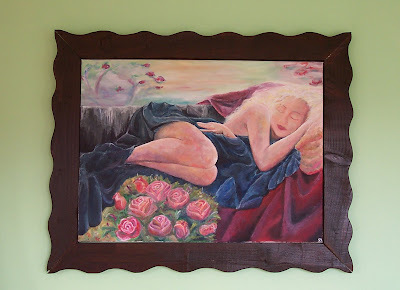 SuperD did his framing magic to give it a proper setting, and now it hangs above our bed where another sleeping beauty often lies snoozing in the sunshine....i obviously don't mean me here, because if there's daylight - i'm working! !